Cyanotypes are a magical process that let you create rich photographic prints using the sun’s light. One of the earliest forms of photography, cyanotypes transform the great outdoors into one big dark room. In this workshop, we’ll be using natural objects to create our own custom prints. We’ll go through how to mix chemical solutions and the basics of composition to make sure you leave with art pieces you love. During the class, we’ll also discuss cyanotypes’ rich history. The method was invented by an astronomer before a lady botanist—and the first female photographer (! )—used cyanotypes to illustrate a book. We’ll be invoking the celestial legacy and feminine badassery of cyanotypes in our gathering, too. You’ll leave the workshop with your own set of original cyanotypes, and a new circle of creative friends. Your gallery wall is about to get an upgrade. 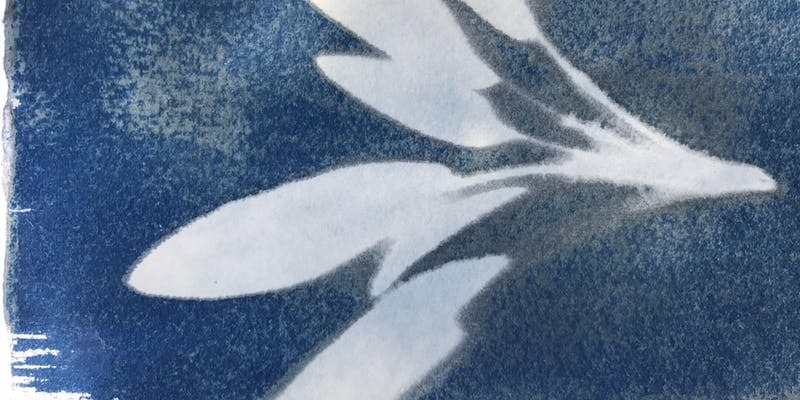 All materials, including paper, chemical solution, and objects will be provided, but you’re encouraged to bring your own objects that you’d like to transform into cyanotypes as well. Anything that is relatively flat (think feathers, leaves, lace or keys) should work well.